The Kings of Slots slot machine should appeal to all, although understandably, there may be a few players who find a little too predictable. 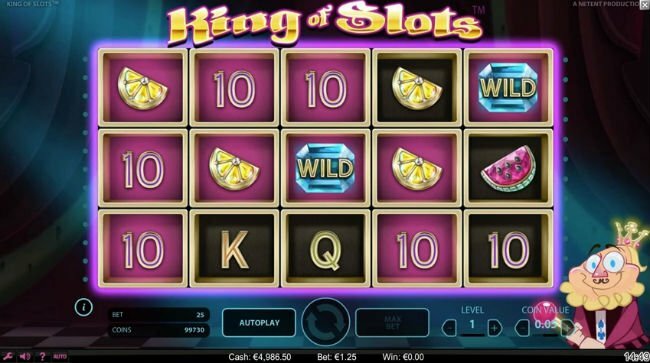 King of Slots is one of NetEnt’s releases, and one which doesn’t really have too much in the way of a theme. The King of Slots which was created as an exclusive for Heroes Casino tries to take you back to the glory days of fruit machines, and one-armed bandits, and it excels at doing that quite well. There isn’t a lot else to play with in the game, though. Discover why that it, in the Kings of Slots slot review, and learn why it may still be worth a look, though. If any slot is going to give off that feeling of old school slot gaming, it needs to have fruit and high-playing card icons upon its reels. Naturally, this slot does. 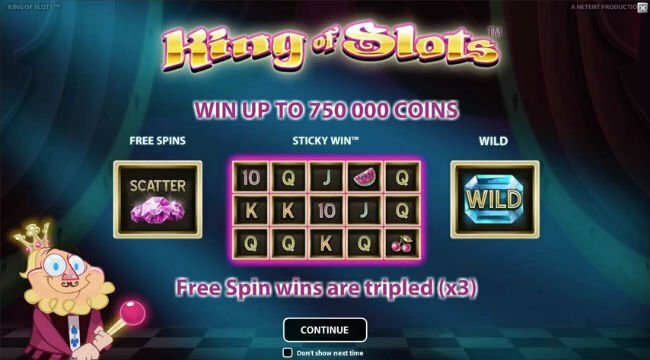 The King of Slots slot machine also contains scatters and wilds, just like modern video slots, so you might even say that it could qualify as a fusion slot, blending elements of classic slots and video slots together. Even though features classic slot imagery, the King of Slots game is still a video slot, which means that wagers can be quite flexible. You won’t be able to adjust any of the paylines in this 5-reel, 25-line game, but you can adjust your coin values, and the amount you stake per line. Coin denominations of 1p up to £1 can be wagered, with up to 10 coins per line being the limit. You are going to find that you bet falls somewhere between the minimum and maximum limits of 25p per spin, and £250 per spin, respectively in this NetEnt developed slot. Classic and simple, King Of Slots takes a nice spot on NetEnt's games roster. 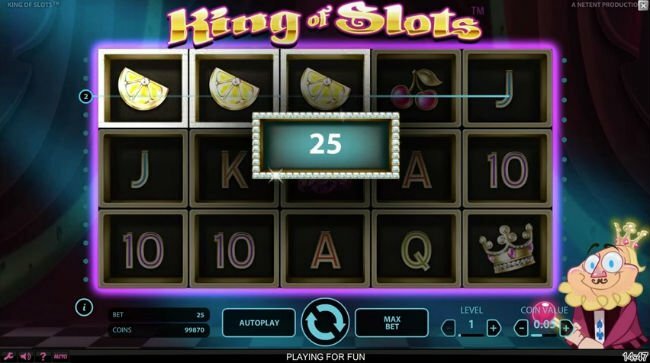 King of Slots does contain some special features, albeit not too many of them. This doesn’t give you a lot to play with. The first special symbol you are likely to come across is the blue diamond. Such a symbol is King of Slot’s wild icon. As a wild, it can replace all others in the game to help you win a payline, save for the scatter icons. Wilds don’t pay out wins on their own. However, there is a sticky symbol feature in this game. On any winning spin (or for 3 or more scatters), the Sticky Win feature is triggered. All reels which contain winning symbols will be held, with the other reels being spun again. Players will have a chance of landing larger wins with this feature. As long as they keep winning, the reels keep spinning. When no new wins are possible, the feature ends. It is also worth noting that wilds can be sticky, too. The main bonus feature in the King of Slots game is the free spins bonus. Of the few Kings of Slots bonuses present, this one is actually the most enjoyable. Players can pocket a total of 10, 15, 20, 25, or 30 free spins for landing 5, 6, 7, 8, or between 9-15 scatter icons, respectively. This is possible because scatters can appear stacked on the reels. Once 5 or more scatters have been located the bonus begins. All winnings in this bonus round are tripled. This NetEnt developed title has a very neutral theme. The Kings of Slots slot machine should appeal to all, although understandably, there may be a few players who find a little too predictable. Not everyone will feel that way, though.